It says "Welcome back Color". See anything wrong with it? THERE'S ONLY ONE COLOR ON DISPLAY! And BLUE is hardly a fashion statement. So what did I do? I IGNORED it except to say "wow- that's stupid!" 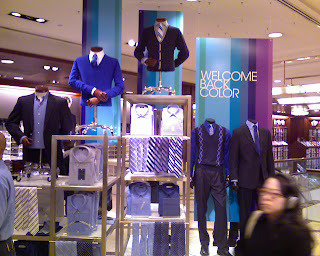 If they wanted me to look at COLORS, maybe give me a display with all sorts of mannequins in different... COLORS, all hanging out together. Then I might say to myself "Ooh- that yellow outfit is cool- I'm gonna get that, and while I'm at it, I'll get that green too!" Instead, I saw NOTHING, and bought NOTHING.